From left, Anderson Curtis, Sandy LoMonico and Gus Marks-Hamilton, of the ACLU’s Smart Justice campaign. 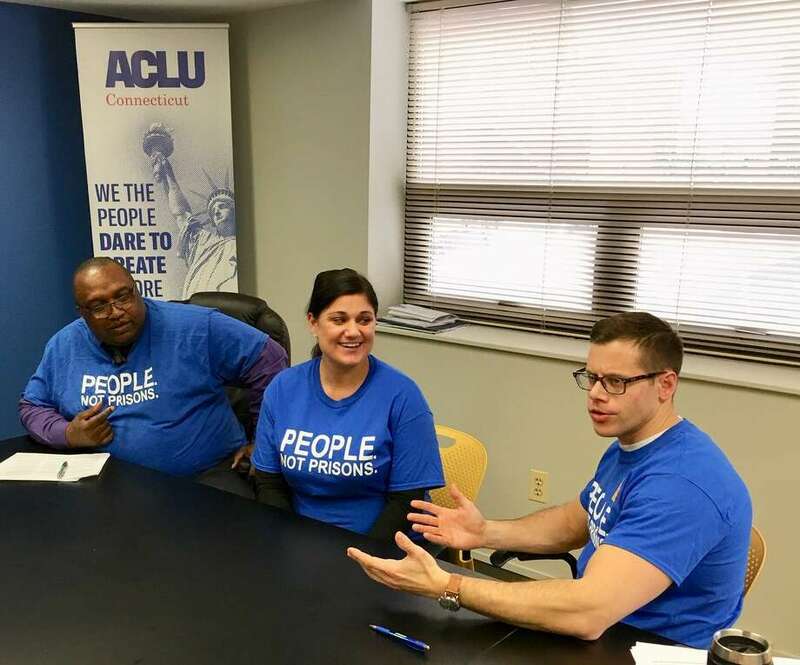 Three formerly incarcerated Connecticut residents working for the American Civil Liberties Union’s Smart Justice campaign unveiled a pair of legislative proposals on Thursday that dovetail with the organization’s nationwide initiative to end racial disparities in the justice system and cut the prison population in half. “The Smart Justice campaign is grounded in the knowledge that those closest to the problem are closest to the solution of mass incarceration,” said Sandy LoMonico, who was hired by the ACLU of Connecticut as a criminal justice organizer. The trio are newly minted lobbyists who will lead the organization’s charge in pushing for criminal justice reforms at the State Capitol. They detailed their priorities for the year’s legislative session at a press conference on Thursday afternoon with state lawmakers. These priorities are reflected in two bills that have been filed but don’t yet have bill numbers. The first would expand the scope of Connecticut’s anti-discrimination laws to include safeguards for those with a criminal record, and the second would require the collection and reporting of aggregate data regarding prosecutorial work. ACLU of Connecticut Executive Director David McGuire said the proposed legislation arose out of recommendations made by Gov. Ned Lamont’s transition committee on criminal justice reform. The first bill, proposed by Rep. Robyn Porter, D-New Haven, would prevent discrimination for those with a criminal record in areas like employment, housing, public education and accommodations, insurance, credit transactions, and public programs and services. Curtis, who wore a bright blue T-shirt emblazoned with “People. Not Prisons,” said former inmates struggle to find stable housing and secure employment to support their families because of discrimination and legal barriers. The other measure would require aggregate data about defendants’ demographics, charges, plea deals, bail requests, pretrial detention, diversionary programs, and sentencing recommendations be reported annually to the state Office of Policy and Management. That information would also be made available to the public. “Transparency is critical for our democracy—with this legislation Connecticut will join other states, like Florida and Massachusetts, that have passed bills that require prosecutors to release data about their decisions,” Marks-Hamilton said. The state’s Division of Criminal Justice is currently working on creating a state funded digital case-management system for the state’s 13 judicial districts. Marks-Hamilton said he hopes the system will make it simple for prosecutors to easily share those statistics. Chief State’s Attorney Kevin Kane said the state is still developing that system but is close to a pilot. Kane said releasing the system will allow the division to participate in the state’s newly implemented Connecticut Information Sharing System (CISS), a comprehensive criminal justice information system. “And if the momentum they achieve to get oversight helps us get our case-management system in place and working well so we can do our job to achieve justice in every case, it will be good,” he added. “And we have people that have done things that have been criminal and they’ve been convicted and they’ve done their sentence and they’ve come home and their heart’s desire is to do right and be right,” Porter said.